It’s spring! It’s the perfect time to dust off the gray doldrums of winter and freshen things up a bit. 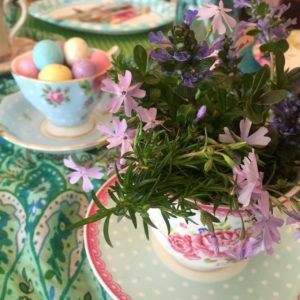 It’s also the perfect time for a blog hop which is exactly why a few of us girls from The Southern Blog Collective have gotten together to bring you some some fabulous spring ideas to help you fluff, floof, and have your tables and porches ready just in time for Easter. 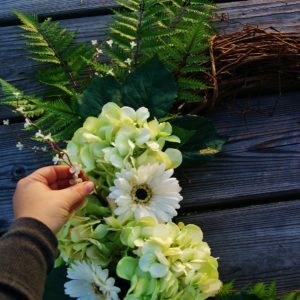 So make sure to click on the link buttons at the end of this article to hop on over to Holly and Kristen’s blogs for more bright and fresh inspiration! 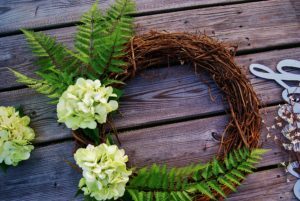 For my part, I’ve got tips for dressing your door with some quick hacks for creating a farmhouse style wreath that hits all the right marks for the season. I know my neighbors are glad to see this wreath because I have been “that” person on our street. You know the one I mean, the one whose porch is a mess and might possibly still contain certain random remnants of a cute winter thing from back in January. Ohhh, it’s true. And it’s not pretty. But thank goodness for Spring and new beginnings, right? Farmhouse style reflects the simple grace of rural living and readily lends itself to all the trappings of spring. Birds, bunnies, nests, eggs, branches, soft blooms, and foliage are natural fits for this looks that celebrates family, hospitality, and the rustic materials and goods of farm living. 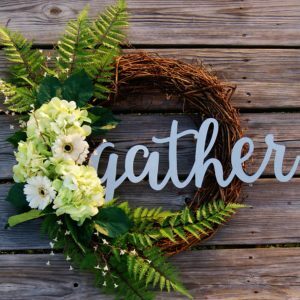 For our wreath, I’ve chosen some heirloom blooms, simple fern, a twiggy, nest-like grapevine wreath, and a galvanized metal sign that bids your friends and family to gather on your porch, in your home, and around your table. 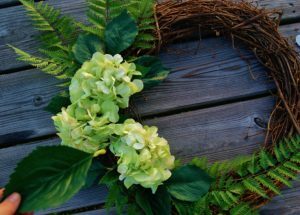 Even though the elements themselves are all farmhouse winners, as we go step by step through making this wreath, I’ll share 3 easy ways to put them together to take the guess-work out of getting that modern farmhouse look you love. 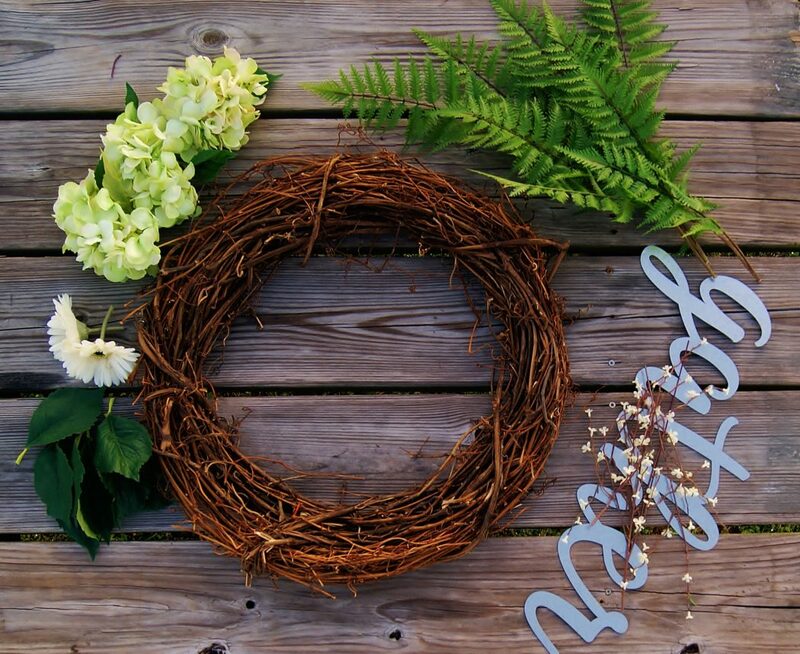 Tip: Anytime I make a wreath, I experiment by placing all the elements on before gluing anything to the wreath. This lets me move, rearrange, add, takeaway, trim and modify the blooms and leaves until I get it just the way I want it before I commit with glue. Occasionally, I take a picture before I dismantle it so that I have a guide to help me put it back together If I don’t think I will remember. To make this wreath, I started with the fern as my base layer. I have been crazy about this asymmetrical shape for some time, so I was super excited to try it out. Plus, it left enough grapevine showing to create the impression of a tucked away bird’s nest. Now, it’s time to layer on the blooms. It’s best to start with the largest flowers first, in our case the heirloom Hydrangea. 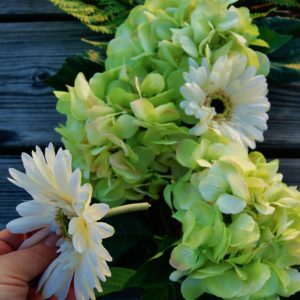 When choosing these flowers, I used our first farmhouse hack- go neutral and/or monochromatic. Farmhouse style usually revolves around a very light neutral color palette with splashes of color here and there. 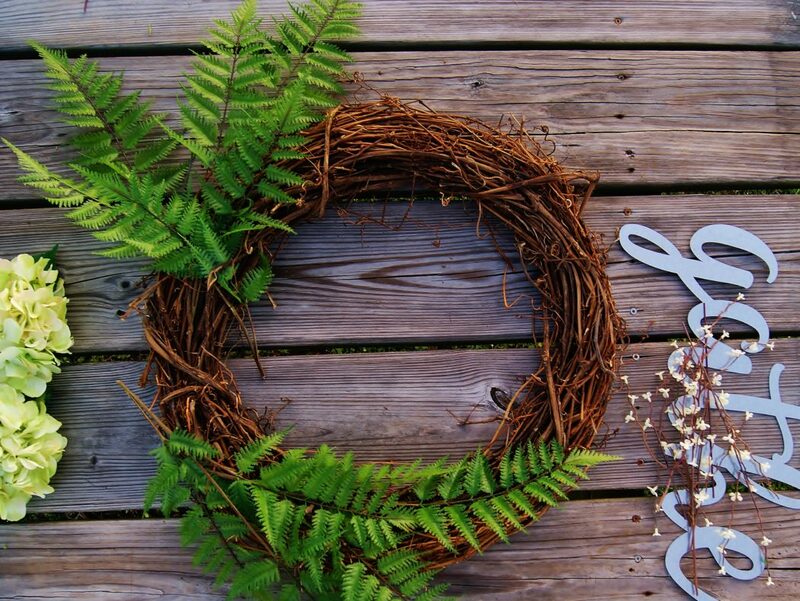 Tip: As with all decorating, it’s good to use odd numbers when deciding how many of one thing to put on your wreath. Groupings of 3 are where it’s at! 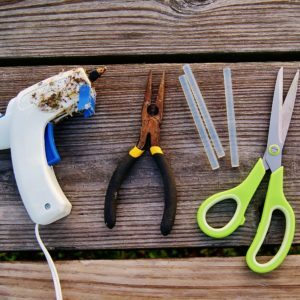 Our second farmhouse hack is make your elements work for you! 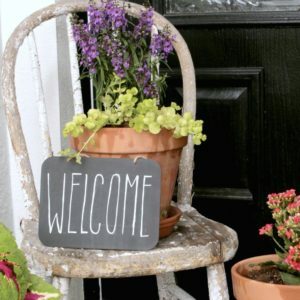 Farmhouse style is all about repurposing, recycling, and upcycling. You’re never limited to using anything just the way it comes. 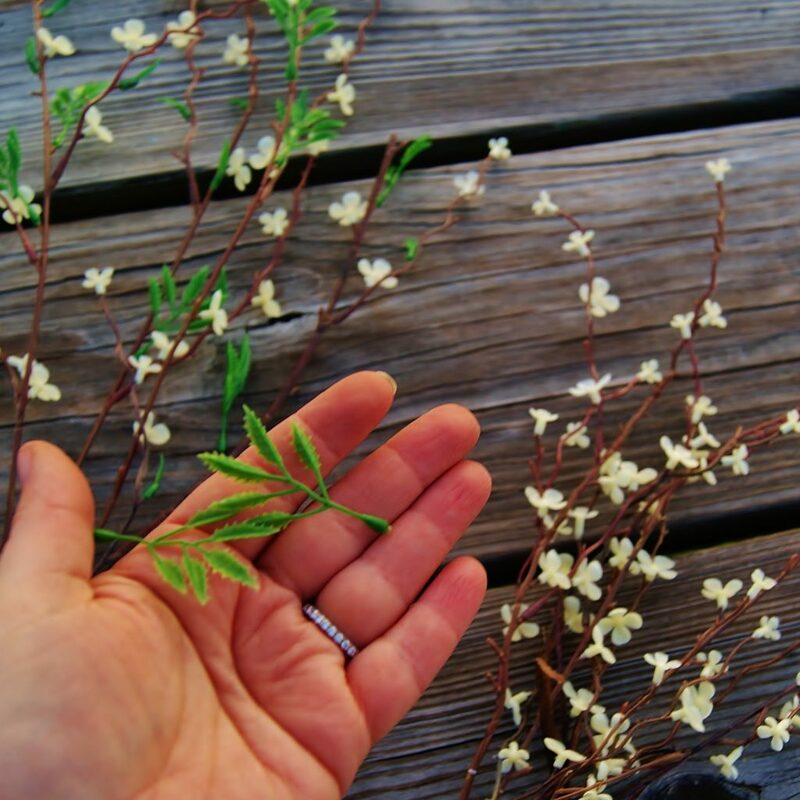 When choosing a branch or bloom, think about it parts, not just the whole. What about the stem? Leaves? Do you want to use all of it? Or would it be more useful/easier to work with it separated into its parts? The Hydrangeas came with long, heavy stems and lots of leaves. I knew I wasn’t going to need all the leaves, and all that stem certainly wasn’t going to work for what I was doing. The first thing I did was strip each stem of its leaves and set them aside to use separately and then cut all but 1-1.5 inches of the stem off using my wire cutters. I loved the delicate little white flowers and airy branches of these stems, but I didn’t like their bright green leaves at all. Not only did the leaves clash with the fern and hydrangea leaves, they had an obvious plastic appearance. No, thank you. So I stripped all the leaves and discarded them, then used my wire snips to trim the long branches into little sprigs of white flowers. Don’t they look so much better now? It’s not always the thing, but the potential of a thing that makes the difference! A lot of times, when working with long stems, I’m tempted to remove the bloom completely from the stem and end up trying to hot glue the back or petals of the flower directly onto the wreath. This usually ends up being really messy and me having burned fingers. 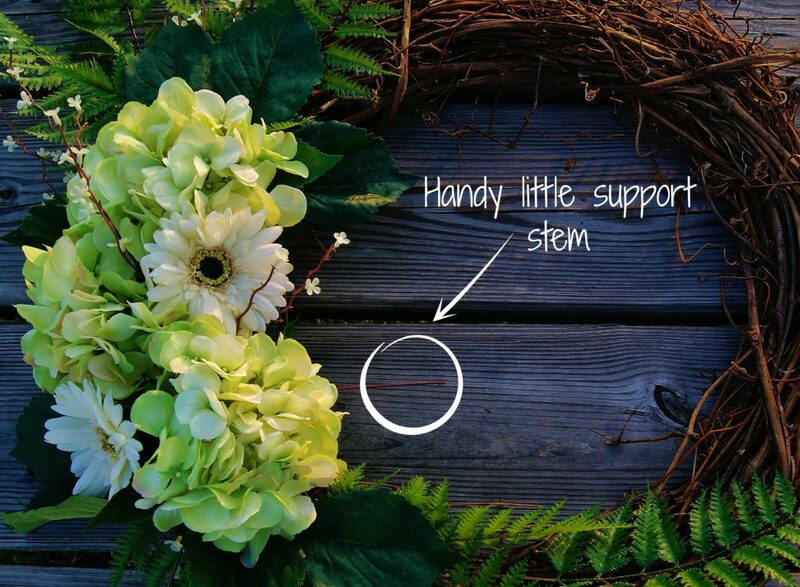 Instead, try leaving 1-1.5 inches of the stem at the base of each bloom when you trim it. This gives you a great place to put all that hot glue and is perfect for fitting that stem down in between those grapevines for snug placement. Plus, it creates the ability to create a true layered look! And for our last hack, what would any modern farmhouse design be without a graphic element? 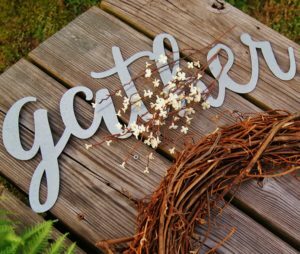 Chalkboards and hand-lettered signs are both popular options, and either can be easily added to the center or sides of your wreath. Think embellishment! Like a little hand that waves ‘hi’! Most farmhouse signs express sentiments of family, hospitality, or farm life. 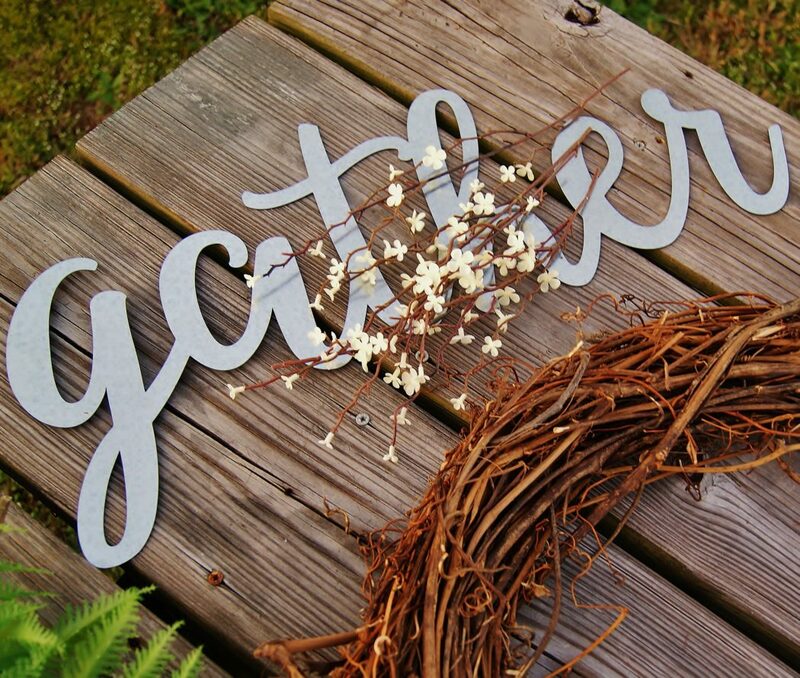 When I came across this galvanized metal sign in a simple script, I knew I had hit the farmhouse jackpot. 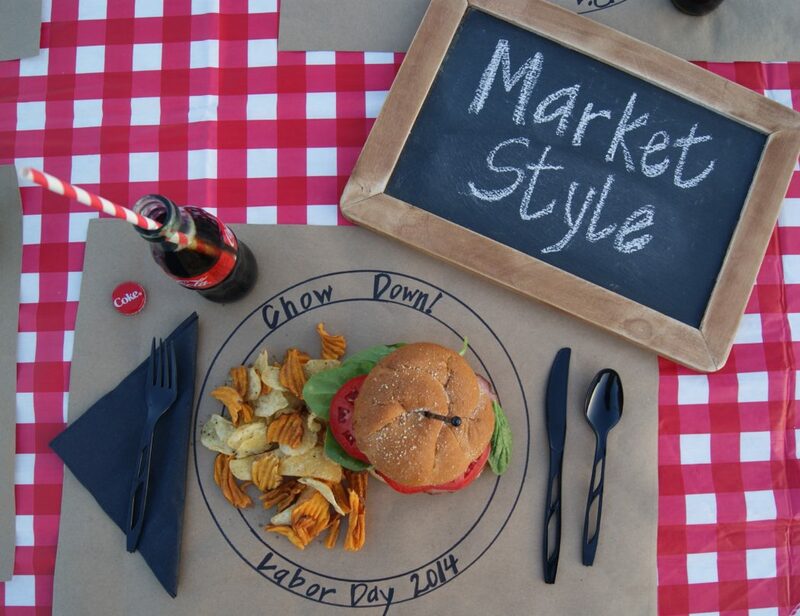 It expressed the perfect sentiment in a classic farmhouse material! Fastening the sign was easier than you might think. 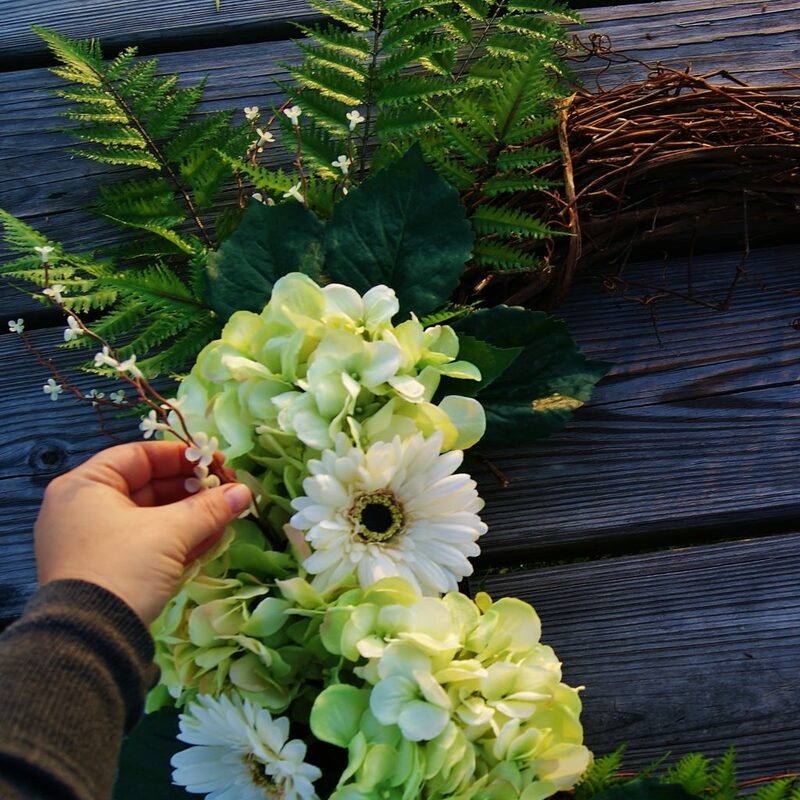 True to farmhouse repurposing, I used one of the long wire stems cut from one of the blooms to create a support. With a little hot glue on one end, I wiggled the wire stem into the inside of the wreath as close to the top edge as I could get it where I wanted to place the sign. 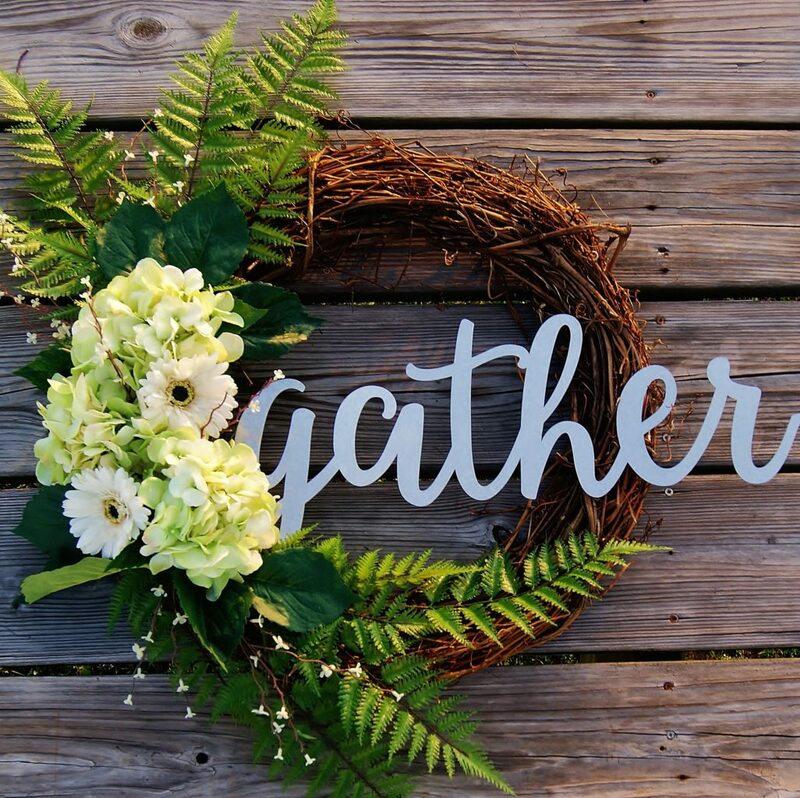 This created just enough surface area to attach the front end of the sign securely to the wreath with hot glue and enough support to keep it from sagging. 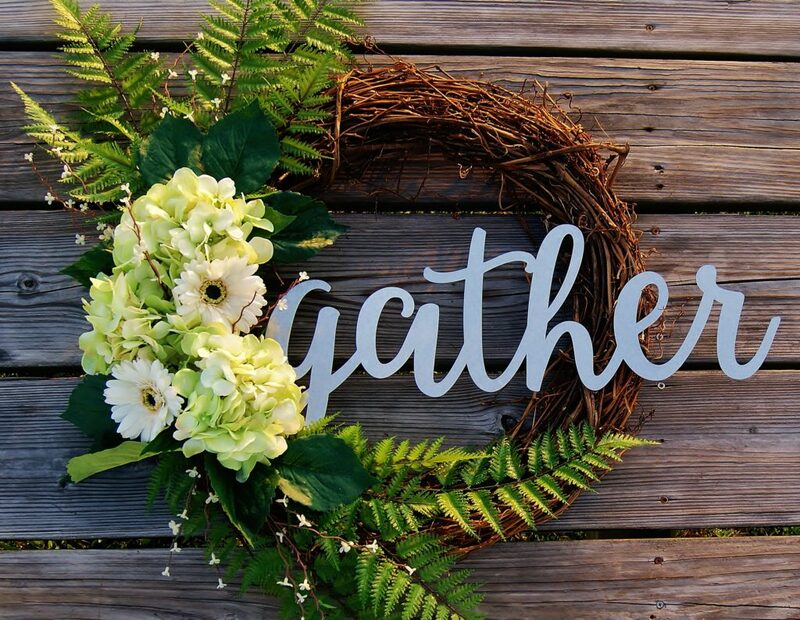 The other end of the sign was attached with just a little hot glue to the opposite side of the wreath. I just love how the sign offsets the asymmetry of the blooms and creates a satisfying and interesting sense of balance. 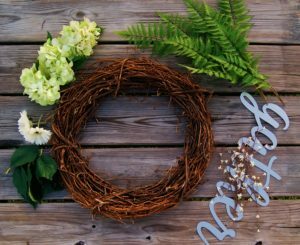 This simple farmhouse style spring wreath just might be my favorite! And I know the neighbors appreciate the porch update. By following these 3 simple rules of thumb- keeping it neutral, making your elements work for you, and adding a graphic element- that farmhouse style you love is easier than ever! 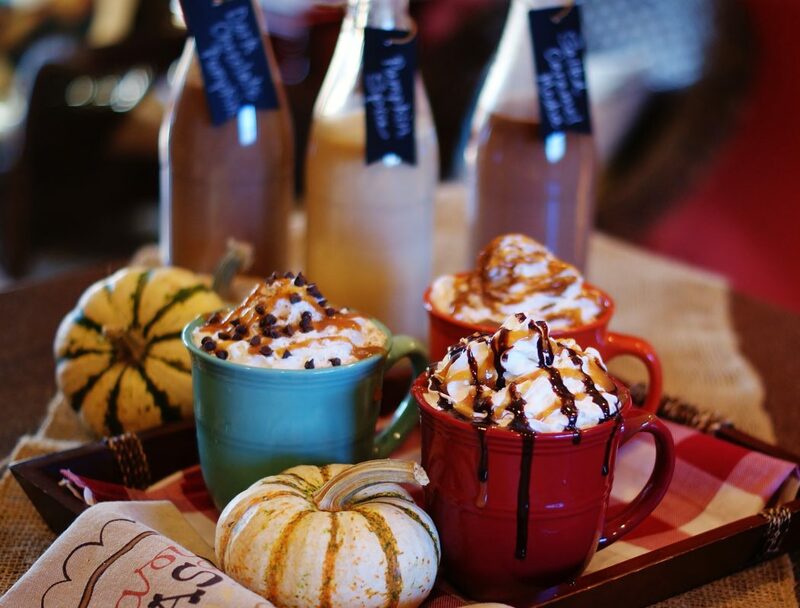 Don’t forget to visit Kristen and Holly over at The Ruffled Mango and McCall Manor! 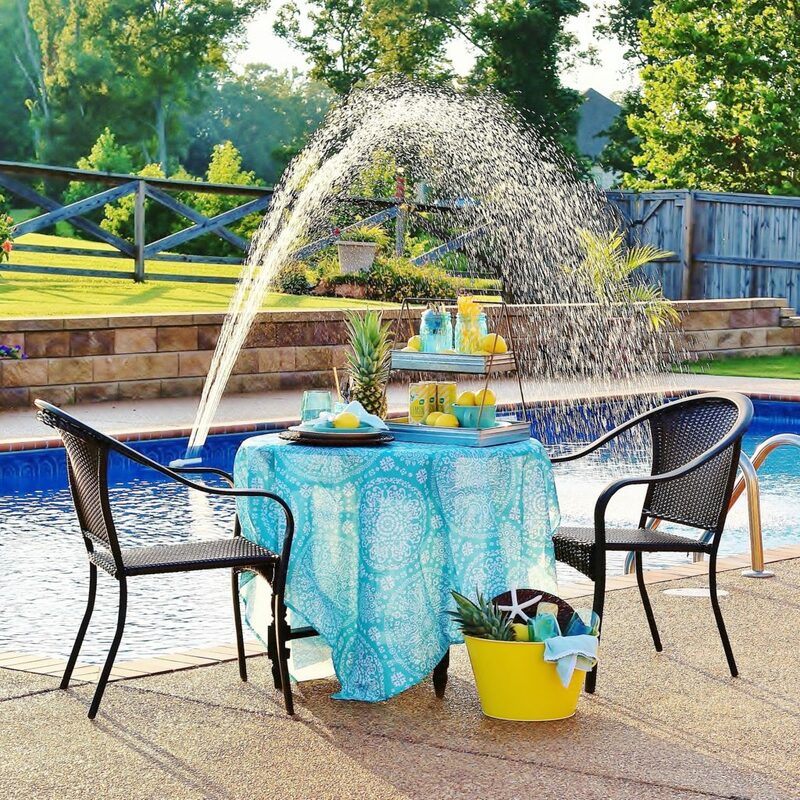 You can find this and other great Spring ideas on Wow Us Wednesday! Thanks, Kristen! To be honest, I am pretty picky about faux flowers! But there are some very real looking ones available these days for not as much money as one might think. And when the craft store has them on for half price! Woohooo!! Even better. Plus, with a project like this that will primarily be viewed from far away (from the street), I feel free to fudge a bit more. Ha!